Photos: Participants await check in early Monday morning. John Harwood introduces the President. On TV screen shot, W.C. students Waldeck and Lawson appear at top left edge of audience. 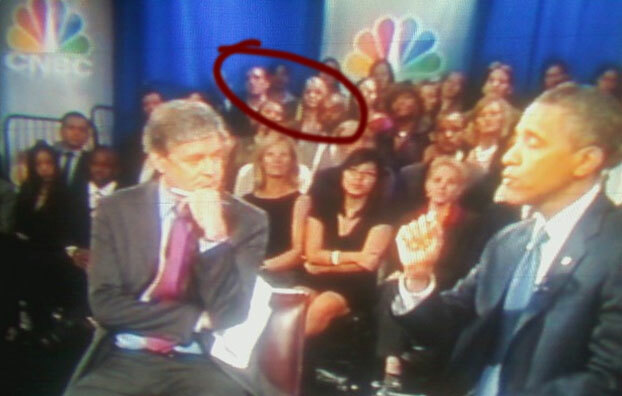 Washington College seniors Lauren Lawson and Chris Waldeck got an insider's view of a major media event Monday, Sept. 20 when they took part in the CNBC Town Hall Event on the economy with President Obama, broadcast live from the Newseum in Washington. 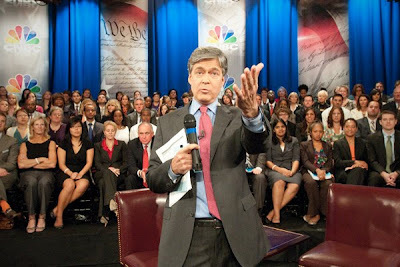 The invitation for Washington College to participate came from CNBC Chief Washington Correspondent John Harwood, an honorary alumnus and long-time friend of the College, who moderated the Town Hall Event. Waldeck and Lawson were selected to represent the College by their professors in business management and economics. They survived the advance security checks and vetting by network producers and were among 227 people of varied ages and occupations seated in the Newseum's studio for the noon broadcast. They also prepared questions for the President in hopes of being one of the few audience members invited to the microphone. Lawson, a double major in economics and business management, wanted the president's outlook on the job market for spring 2011 and his advice on how new graduates can find jobs. Waldeck, an economics major, wanted Obama's ideas on how to get American businesses to stop sitting on nearly 2 trillion of financial capital and invest it in the nation's economy. Neither would have the chance to ask their question. But both were satisfied just to be in the audience, four rows away from Harwood and Obama, for the hour-long production. "The feeling of being in the room with the President did not wear off," says Waldeck, who is the treasurer of the Washington College Republicans. Being so close to the President did not convince him to switch parties, but he says he was "extremely impressed with how quickly Obama could carefully word his responses." Lawson, who describes herself as an Obama supporter who has been disappointed with the effectiveness of the president's policies so far, did get her 15 seconds of fame earlier in the day: While waiting in line outside the Newseum, she was interviewed for CNBC's "Squawk on the Street," which aired live from 9 to 11 a.m.
CNBC rebroadcast "Investing in America: A CNBC Town Hall Event With President Obama" that evening at 8 p.m., which gave Lawson and Waldeck the chance to see what the TV audience saw. Lawson enjoyed being able to compare how the event came across from both inside and outside the intimate studio. "I thought that both the questioners and Obama made some powerful arguments, though there is much left to be considered," she says. "Of course, it was fun to spot Chris and myself in the audience!" For more on the event, including slides and video, go to: www.obamatownhall.cnbc.com.